“Our aim in developing the Air Force Two Premium was to achieve almost the same level of musicality as our flagship the Air Force One. To this end we looked at the material of the main platter. The Air Force One uses a stainless steel main platter while the standard Air Force Two uses a platter made of aluminum. Since the beginning of the standard Air Force Two, it has been found that the difference in material of the platter is even more critical for tonality than the difference in weight. This is why we began testing new materials. As a result of various experiments, gunmetal was chosen for the platter of the Air Force Two Premium. This material is an alloy of copper and tin, and was often used in audio equipment in the heyday of analog audio. As gunmetal is relatively soft and tensile, a subtle glow is added to the sound while its heavy weight further increases the scale of the sound stage. Descended from the flagship model, the core mechanism contained in the exquisite design concept is designed in such a way to exploit the aerodynamic force equivalent to sound energy to the full. It is a well-known fact that an analog disc is a sensitive and very fragile program source in which waveforms transmitted as air vibrations generated by the original music are imprinted into a microgroove in the record. The turntable should thus be the key center of the playback process by extracting the original oscillatory waveforms in an authentic way and transmitting these as accurate audio signals. Any signals other than these valuable micro waveforms imprinted on the disc ought to be detected by a stylus as maleficent without exception. There are specific examples such as frictional vibrations caused by bearings under a rotating turntable platter, vertical vibrations of a tonearm caused by warpage of an analog disc, or vibrations due to some stylus movement resonating with an even flat disc to the contrary and in addition to them, direct vibrations from the floor propagating directly through a turntable. There are surprisingly a constellation of maleficent vibrations. 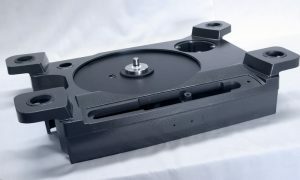 In early turntable design various attempted procedures have been rendered such as improved machining method for bearings, putting a stabilizer weight on the disc plate to reduce warpage and resonance, and supporting the overall player on springs. As a result, it is a fact that no one could accomplish their objectives until today. Two key factors of “Air Force” descended from the flagship reference. An Air Bearing Mechanism and a Vacuum Disc Suction Mechanism. One of the key mechanisms over “Air Force Two” descended from the flagship reference is an Air Bearing Mechanism. Because of this, all the issues there have been completely resolved. This system is configured with no conventional bearings and a platter simply installed on the glass plate with a polished flat surface to be aligned with the center shaft for positioning. At this stage, the platter is absolutely still, but once the ancillary electric air pump starts forcing air into the turntable, you would see the platter floating instantly to the height of 0.03mm (30μ) above the base and rotating in deep silence and with absolute smoothness, especially due to the air bearing mechanism. As the platter load is no longer applied anywhere, not only frictional noise or various vibrations are perfectly eliminated but also the primary performance of highest quality is infinitely maintained. Another key aerodynamic-force-dependent mechanism is a vacuum disc suction system. Even though the platter is rotating in extremely quiet manner and with maximum accuracy, disc warpage may cause a vertical motion of a tonearm and at the same time undesired stylus movement will induce sympathetic vibrations. Under such circumstance, no music signal is extracted with complete fidelity. According to undesired vertical motion by the tonearm, collaterally the stylus is seriously damaged. Sympathetic disc vibrations may lead deadly loss of music signal quality and its sensitivity. It was fashionable to apply a stabilizer weight on the disc as a solution in the past. With that method it does neither give sufficient solution on disc warpage, nor suppress the development of resonance. While on the other hand, with our vacuum disc suction system, right after setting a disc on the platter, just one press on SUCTION button located in the main unit, allows a disc attracted on the platter simultaneously with it floating. You can see in a split second, as a result, a completely flat disc surface and the platter is keep rotating as is in the environment where the vertical motion of the tonearm disappears and the potential capability of the cartridge exerts its performance to the full, but not only those, it is possible to extract only the valuable music waveforms imprinted in the groove with high-fidelity. After that, a press on the SUCTION button again allows full evacuation instantly enough to release attraction of a disc plate at the same time. One of the touchy issues for a turntable is how to isolate it from vibrations propagating through floors. There often occurred different vibration problems when a turntable was installed on the floor even finished with vibro-isolating materials, because vibrations by speakers or people’s movement might propagate through the same floor. To prevent those symptoms in the past, various corrective actions like isolation by springs or buffer materials were applied to many products. However, as all of you may know, we have barely seen successful examples where there was no wobbling. In the process of developing the flagship reference, we decided to employ the hybrid suspension system configured with the air and the macromolecular polymer as the third key mechanism that resulted in an elegant solution of this particularly difficult challenge. However, in contrast to the “Air Force One”, as the total weight and its distribution of the “Air Force Two” are different, it is not always technically suitable to employ the same system. Therefore, instead of three-legged structure we needed to develop a new suspension system with four-legged structure which accommodates upper chamber sealed with air and lower rubberoid diaphragm with built-in springs and sealed with oil internally. 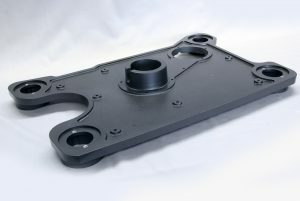 That diaphragm is connected to the upper chamber via a tiny hole of the orifice plate and damps the spring movements mutually by internally sealed oil and air from the chamber and as a result, produces a high vibration insulation effect by means of reducing Q-factor of resonance. This means that the “Air Force Two“ is the same system as the “Air Force One” in terms of exploiting air force effectively for quality, and even better and easier to use for longstanding audio. A precisely flat hard glass face is used under the platter, and air flow creates a 30 micron clearance between the platter and the glass face. The critical issues in design for the “Air Force Two” are to achieve price reduction and to ensure the existing performance on par with the flagship reference, the “Air Force One” as a best buy product. Since to manufacture the chassis of the “Air Force One” incurs many costs due to cutting a metallic block by a computerized numerically controlled (CNC) machine, we have successfully switched to the aluminum precision-cast and painting the chassis instead. As casting is not only integrally molding the whole of a chassis mechanism but also produces a better volume-production effect, we have successfully accomplished significant cost reduction without sacrifice of performance. The chassis supported by large-size four-legs is of a double-layered structure consisting of an upper layer with complex configurations and a flat but thick lower layer. To secure sufficient strength, not only the thickness but also ribs are employed according to the need. As a result, the total weight reached 32.6Kg. The heavy chassis coated with a calm color of feeling will support the fundamentals of music and sound firmly. As the “Air Force Two” is a arm-free designed turntable, no tonearm is incorporated. The chassis can mount two tonearms at the same time and both 10 inch type or 12 inch type can be accommodated. Standard tonearms with the effective length of 10 inches can be mounted on the right side of the turntable within standard specifications, but also an optionally available arm base for the second tonearm can be installed on the far left of the chassis where a tonearm with the effective length of 12 inches can be mounted. Therefore, both types can be mounted on the turntable. Since additional work is required for each mount to meet individual specifications, the particular tonearms of your choice should be communicated to us prior to the placement of your order. The fabric belt drives the heavyweight platter made of precision cut aluminum. The rotation is supervisory-controlled through a non-contact sensor and a microcomputer resulting in a very high rotational accuracy. 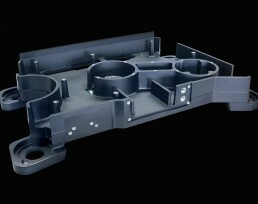 The turntable platter reaching a weight of 10Kg is manufactured by precision cutting a solid aluminum block (A5056). In analogy with the flagship model, the platter of the “Air Force Two” is equipped with a vacuum disc suction mechanism. In addition, the disc-absorption surface of the upper platter is covered with special thin film damping materials. The rotation of the platter is driven by a fabric belt. On belt for driving the non-stretch polyurethane fiber belt with polished surface is employed in line with the “Air Force One”. Please note that a common rubber belt seems much easier to handle than this belt when replacing. 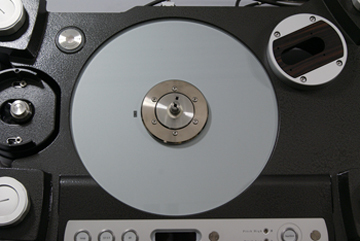 However, given the high-grade playback, for the high-precision heavyweight turntables like the “Air Force One” and the “Air Force Two” belt-drive by a common rubber belt obviously cause a loss of performance due to its elasticity and as a result convincing sound quality is not attainable. The motor for driving incorporated in the “Air Force Two” is a high-precision AC synchronous motor stored in free-standing rugged aluminum housing. The power supply is stored in the stand-alone cabinet by the name of “Air pump & Power supply Unit” as Power Amplifier Drive ‒ Rotation Control System that watches and controls a rotation speed of the platter through non-contact sensor and maintains a constant speed through speed adjustment microprocessor circuit. Due to outcome using systems including previously mentioned “Air Bearing System” a high rotational stability with less than wow and flutter 0.03% accuracy is achieved. Switching the revolution speed between 33 1/3 rpm and 45 rpm is available and additionally as a maximum 10% pitch control in +/- 0.1% steps of each constant speed is possible, the playbacks with your favorite pitch to suit the discs like instrumental albums become operational. The “Air Force Two” is configured with a turntable main body, a driving motor in free-standing housing and in addition to them the “Air pump & Power Supply Unit” in a separate case. The “Air Force Two” is configured with a turntable main body, a driving motor and in addition to them the “Air Pump & Power Supply Unit”. In the “Air Pump & Power Supply Unit” an electric air pump, an air condenser and power supplies for the circuits are installed. The motor-powered air pump enclosed in a robust die-cast case provides incomparable quietness with conventional simplified vibration motors and as an additional configuration a unique rubbersuspension is employed for scrupulously cutting-off micro vibrations. This driving motor is combined with the air condenser which is a tempered glass chamber mechanism where air evacuated from the air pump is stored temporarily and after absorbing the pulsating air flow completely, the processed air is fed for the air bearings and the disc attraction. Other than the above mechanism, total 4 distinct power supplies for a motor driving, a rotation control circuit, an operating circuit and for LED light are enclosed in the unit. By each part specialized with a dedicated power supply it is achieved to ensure rich enough power to drive a motor and to enhance the performance of each part. By also isolating those power supplies from a turntable main body the electric interference to the faint music signals is cancelled and that enables realization of a superior playback. Needless to say that a dust is a great enemy to the analog record. However a large dust cover to cover a whole body bothers some time when removing or putting on obviously. Even so, in this case it is natural that dusts on the platter can be transferred to the back of an analog disc if not using a dust cover. To resolve this problem the acrylic dust cover (which only covers the platter surface) is designed to negate dust and is included as standard for the ”Air Force Two Premium”. As you would understand by descriptions so far, this model is a large-sized and heavy weight instrument. Therefore a minimum installation space with 685mm width and 460mm depth or above is necessary. And the whole weight of a main body is 47Kg. In order to realise the best performance it is essential to satisfy the required conditions accordingly. With that in mind and the fact the ideal installation requirements are not easily resolved, our thick special damping table is available as an option. As the damping table is made of specially pure acrylic crystal with a thickness of 40mm, alied to it’s strength and superior damping performance is the perfect base for the “Air Force Two”. ACCESSORIES SUPPLIED Tonearm base x 1 (drilled for specified tonearm). An extra cost may be required according to the tonearm. Cables, Air hoses, Platter setup tools, Users manuals. OPTIONAL ITEMS & ACCESSORIES Extra tonearm base. Exclusive rack manufactured by Artesania Audio.